This recipe can be adapted to other berries or fruit with a tweak on the glaze. For this glaze I did not see the need to add color, so I used lemon juice to flavor, but if you like some color, you can use 2 Tbsp of jello crystals to the glaze, according to fruit of choice. In small pot, heat 1 cup milk until you see tiny bubbles on the side. In the meantime, in small bowl, mix dry ingredients, stirring in 2 Tbsp of milk to make a paste, stir in the yolk and the last 2 Tbsp of milk. Stir into hot milk in pot and keep stirring until smooth and bubbly. Pour into baked pie shell and allow to set. Stir slightly cooled glaze into fruit and spread into pie shell, over the custard. Beat whipping cream until peaks form when you lift the beaters. Spread onto fruit, lifting the spoon, to from peaks or use a decorator tip on a bag. 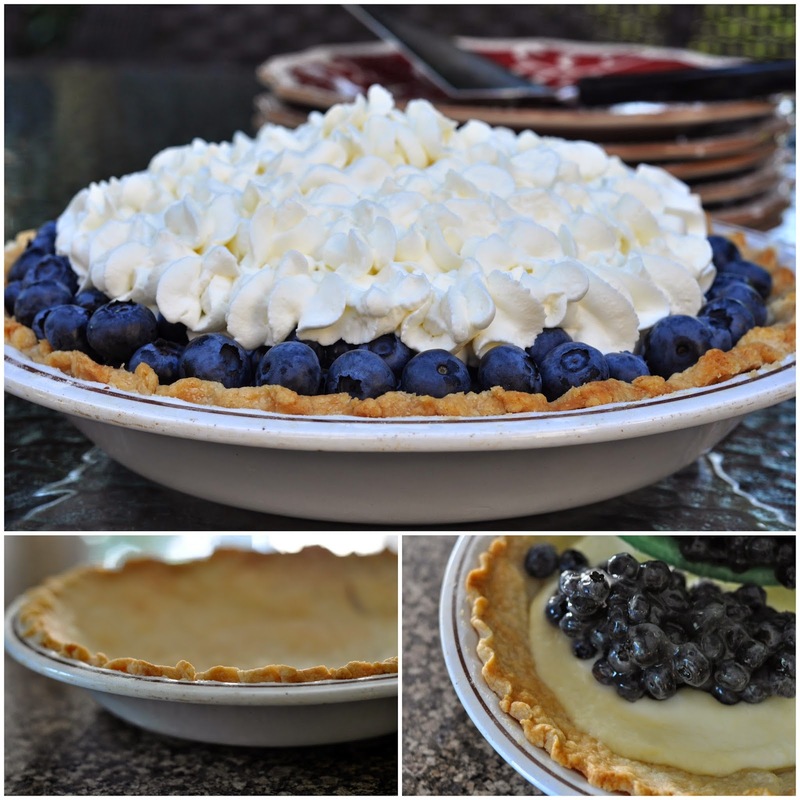 I kept the whipped cream away from the edge and decorated it with fresh berries. Allow at least an hour in the fridge to set before serving. It looks so pretty and sounds heavenly. How nice that it will accomodate other berries and fruits, too. Very versatile! Had to make! Looks too yummy! One question, do I need to have the custard thick before I put on the pie crust? I have let the custard boil for a good 5 mins and it doesn't seem thick let I thought it would. Sorry, I did not see this until just now and you have probably figured it out by now. You only need to boil for a minute. The custard thickens as it cools. I hope it worked out for you. Oh YUM! I will be making this A.S.A.P. I've made custard pies but I never thought of adding fruit but what a great combo. I love fruit of any kind but berries are my favorite. Thank you!